Yesterday was just another episode in the daily soap opera of congressional Democrats striving to manipulate Republicans through extortion and slander. Liberals continue to wage war on the Republicans over the budget. 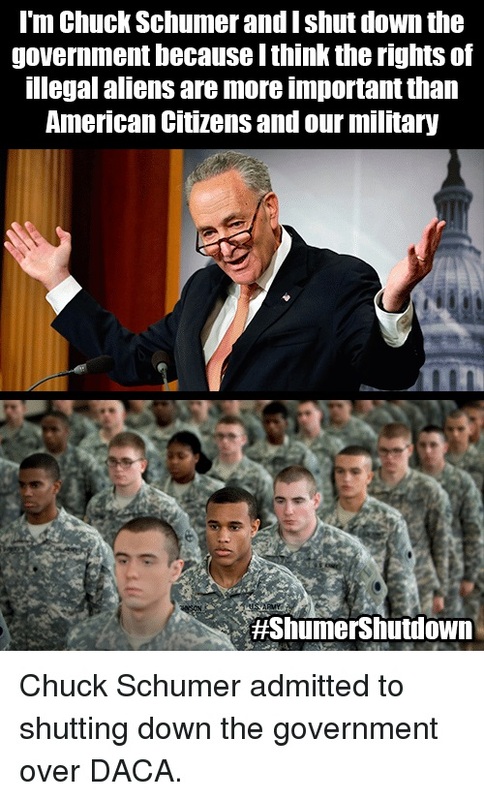 Democrats continue to demand that military cuts be kept in effect and that illegals be given citizenship in return for their vote on the federal budget that requires 60 votes in the Senate in which Republicans only have 51. The budget will increase the federal deficit by $300B. Sen. Rand Paul (R-KY) leads the opposition of keeping Obama-like deficits. The Left is slandering Republicans for increasing the deficit, which only the Freedom Caucus of the Republicans has been against whether Democrats or Republicans are running the show. But Trump’s deficits are not Obama’s deficits. Obama gave over $800B to Wall Street every year for eight years without passing a budget but using continuing resolutions even when Republicans had control of Congress to bypass them. But even when they got the majority Republicans still passed a budget giving Obama his super excessive spending. Now Democrats are trying to slander Trump running a deficit to fully fund the military. Both parties run deficits when in power, but spend that money on opposite agendas. The National Debt of $20T belongs to Democrats. Republicans account for just $1T of debt borrowed to pay for the Iraq/Afghan wars that Obama claims “were not paid for.” They were paid for the same way he paid for his “stimulus.” The other $4T in debt during the Bush years was all done by Democrats. A quick synopsis of the last ten years is in order. Obama blamed Bush for the budget deficit of $1.5T in 2009 which was an absolute lie. Bush refused to sign that budget and told Democrats who controlled Congress to send something reasonable. Instead, Pelosi withheld the budget and had Obama sign it. He touted it as “saving jobs,” which is pure hokum as Democrats raised taxes massively through ObamaCare and gave that “stimulus” money to blue state unions to help defray the increases. They then passed CRs for the next six years to bypass Republicans controlling the House where the budget is made. When Republicans got control of the Senate in 2015 McConnell foolishly passed the budget Obama wanted making them complicit in the $10T debt Obama racked up during his regime. The Obama Depression was done in stealth by covering up inflation through wage decreases and printing money. The degree to which Democrats go to add to the debt was evidenced in the Reagan years when his tax cuts generated such economic growth that tax revenue doubled. But Democrats continued to run massive deficits to blame Reagan for the debt. Reagan proved that tax cuts generate economic growth that creates greater tax revenue. Liberal’s mantra that Trickle-down doesn’t work is just one more massive lie by which they live and die. Were it not for trickle-down people would still have vacuum tube TVs and wall phones. The damage Obama did the economy with his unconstitutional executive orders that included shutting down America’s coal mining was immense. Trump’s tax cuts are stimulating economic growth that will never be seen under a Democrat president and the Left hates him for it. Democrats believe money belongs to them first and that any tax cut “must be paid for” by tax increases on someone else. That’s why when they gave tax breaks to blue states for their excessive state taxes and denied that loophole to red states that run low or no state taxes they also gave them the so-called stimulus money. Robbing Peter to pay Paul is the Democrat way. Democrats would make America into Venezuela or Cuba, but thank God that the majority of states saw the light and changed their votes. If Hillary were president then the economy would continue to stagnant, America would continue to decline, and the people would have no clue how the Democrat’s Deep State corruption has infiltrated and warped this nation. This entry was posted in Economy, Politics and tagged Democrat's Amnesty, Donald Trump, Military funding, Trump budget battle, Trump tax cuts. Bookmark the permalink.